Franke Model Oval V inset vanity basin, 590 x 375 x 160 mm. Unit to be manufactured from a high grade austenitic Stainless Steel, 0,8 mm gauge. Bowl size 490 x 275 x 160 mm deep with 40 mm waste outlet and overflow hole, tap ledge including a 32 mm tap hole. The underside of the basin to include Stainless Steel lugs for mounting the unit to the work top. 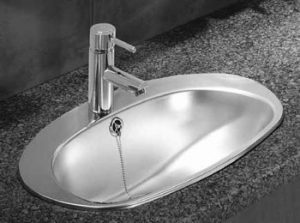 This durable basin is ideal for commercial or industrial wash rooms and public restrooms as it will not stain nor chip. Austenitic stainless steel contain high amounts of chromium and nickel and are the most corrosion resistant, ductile, and weldable type of stainless steel and are used mainly for heavy duty work such as in the chemical industry’s equipment and food processing equipment. Oval V basin. Does come with pre-drilled tap hole.